Use this guide when filling out a W-4. When you start a new job — or your financial or marital situation changes — you will likely have to fill out a new W-4 form. This form is used to determine how much of your income should be withheld for federal taxes, so it’s important to take the time to fill it out carefully and completely. If you’re not sure how to fill out a W-4 form, keep reading for a simple step-by-step breakdown. The Basics: What Is a W-4 Form? 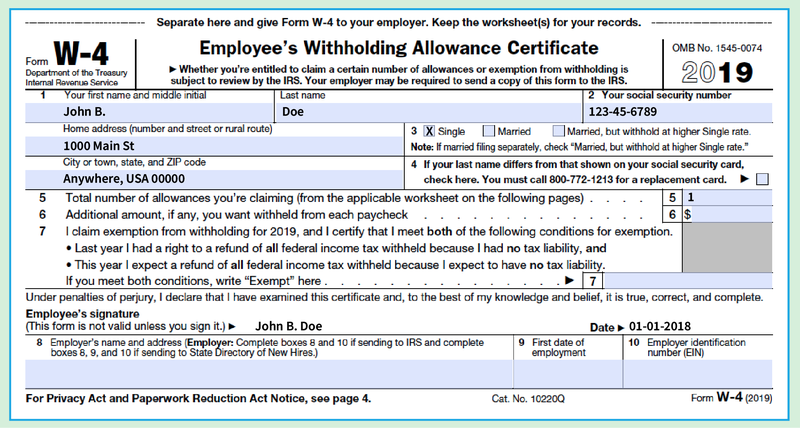 The W-4 form — which is an Employee’s Withholding Allowance Certificate — is used to let your employer know how much of your income should be withheld for federal taxes. You should fill out a new W-4 whenever your personal or financial situation changes. In fact, the IRS recommends filling out a new W-4 form every year. The form includes fields for your name, address, Social Security number, marital status, total number of allowances you are claiming, any additional amount you want to be withheld for each paycheck, whether you are claiming exemption from withholding, your employer’s name and address, your first date of employment and your employer identification number. 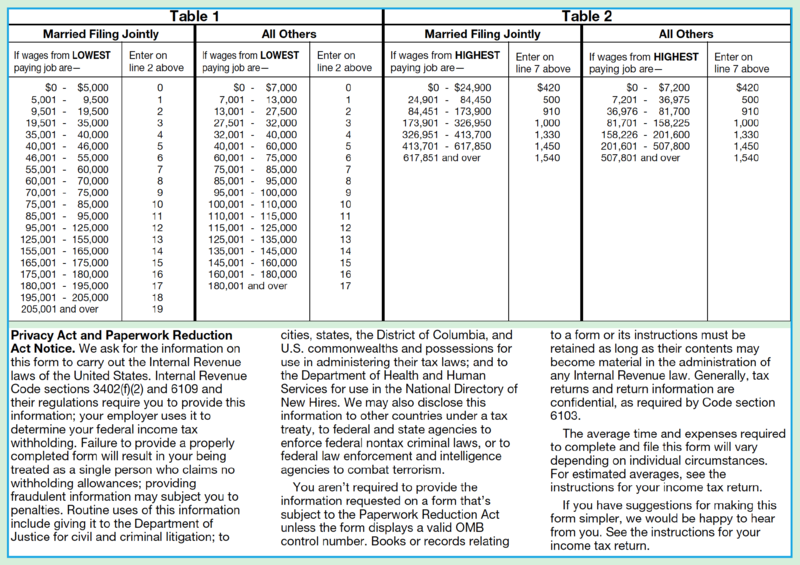 You can download a copy of the 2019 W-4 form (with all of the worksheets included) on the IRS’s website. The best way to fill out a W-4 is to start with the worksheets, and then move on to the form itself. If you need help filling out a W-4, carefully follow each of the following steps. The first part of Form W-4 is a Personal Allowances Worksheet that should help you determine how many exemptions you can claim. You are welcome to fill out the worksheet, but you don’t need to submit it to your employer. Instructions on how to fill out a W-4 form single are different from how you’d fill out the form if you’re married. If you are single: Generally mark single and claim a single allowance for yourself. If you are a married taxpayer and both spouses work: Mark married for your status. If you have dependents, specifically children under 17: Consider claiming an allowance for each child. If you don’t have children under 17 eligible for the child tax credit: It’s not recommended to take any other allowances against withholdings. Here’s a guide to filling out each line on the Personal Allowance Worksheet. 1. Enter “1” on line A for yourself. No matter what your status is, everyone will enter a “1” on this line. 2. If you are married and filing jointly, enter “1” on line B. Otherwise, leave this line blank. 3. If you are filing as head of household, enter “1” on line C.
According to the IRS, you should only claim head of household filing status if you are unmarried, and pay more than 50 percent of the costs of keeping up a home for yourself and your dependent(s) or other qualifying individuals. If this does not apply to you, leave this line blank. You are single, or married filing separately, and only have one job. You’re married filing jointly, have only one job and your spouse does not work. Your wages from a second job, your spouse’s wages from a second job or the total wages from both of your second jobs are $1,500 or less. 5. If you have children, read here about how to fill out line E — the child tax credit can save you up to $2,000 per qualifying child for children 17 and under. Enter “4” for each eligible child if your total income is less than $71,201, or $103,351 if you are married filing jointly. Enter “2” for each eligible child if your total income ranges from $71,201 to $179,050, or $103,351 to $345,850 if you are married filing jointly. Enter “1” for each eligible child if your total income ranges from $179,051 to $200,000, or $345,851 to $400,000 if you are married filing jointly. If your total income is higher than $200,000 — or $400,000 if you are married filing jointly — you don’t qualify for this credit and will enter “0” on line E.
6. To fill out line F properly, remember that dependents who can’t be claimed for the child tax credit might still qualify for the credit for other dependents, according to the IRS. Enter “1” for each eligible dependent if your income is less than $71,201 or $103,351 if you are married filing jointly. If your total income is higher than $179,050 — or $345,850 if you are married filing jointly — you don’t qualify for this credit and will enter “0” on line F.
7. To fill out line G correctly, you will also need to fill out Worksheet 1-6 of IRS Publication 505. 8. Add up the numbers on lines A through G to calculate your total number of allowances, and enter the number on line H.
Remember to always double-check your math when filling out this worksheet and other tax forms. Complete the Deductions, Adjustments and Additional Income Worksheet only if you plan to itemize tax deductions or claim certain credits on your income tax return. You won’t need to do this if you plan on claiming a standard deduction on your income tax return. Enter “$24,400” if you are married filing jointly or a qualified widow(er). Enter “$18,350” if you’re head of household. Enter “$12,200” if you’re single or married filing separately. 3. Subtract line 2 from line 1, and put this number on line 3. 4. Use line 4 to record an estimate of your 2018 adjustments to income, or any additional standard deduction for age or blindness. Supplemental income loss from rental real estate, royalties, partnerships, S corporations, estates, trusts, REMICs, etc. 5. Add lines 3 and 4, and enter the total on line 5. Again, always remember to double-check your math when adding up amounts on your W-4. 6. Enter your estimated non-wage income on line 6. Non-wage income includes interest, dividends, net rental income, unemployment compensation, alimony, gambling winnings, prizes and awards, hobby income, capital gains, royalties and partnership income. 7. Subtract line 6 from line 5, and put that amount on line 7. If the number is zero, write “0.” If the number is less than zero, enter that amount in parentheses. 8. Divide the amount on line 7 by $4,200 and put the result on line 8. If the number is a negative amount, write it in parentheses. Do not include fractions. 9. Put the number from line H from the Personal Allowances Worksheet on line 9. As a reminder, the information on line H is the total you got when you added lines A through G on the Personal Allowances Worksheet. 10. Add lines 8 and 9, and put the number on line 10. If the number is zero or less, write “0” on line 10. Line 10 will reflect your total W-4 allowances, which will go on line 5 of the W-4 Form. If you are also planning to use the Two-Earner/Multiple Jobs Worksheet, proceed to the next worksheet. If you have more than one job at a time or are married filing jointly and have a working spouse, you should fill out the Two-Earners/Multiple Jobs Worksheet. Keep reading for step-by-step instructions on how to fill out the Two-Earners/Multiple Jobs Worksheet. 1. On line 1, enter the number from line H of the Personal Allowances Worksheet if you did not fill out the Deductions, Adjustments and Additional Income Worksheet. If you did fill out the Deductions, Adjustments and Additional Income Worksheet, put the number from line 10 of that worksheet on this line. 2. Use Table 1 of the worksheet to determine the number that should go on line 2. Be sure to use wages from your lowest-paying job. If you are married filing jointly and the wages from the highest-paying job are $75,000 or less, and the combined wages for you and your spouse are $107,000 or less, don’t enter a number greater than “3” on line 2. 3. If line 1 is more than or equal to line 2, subtract line 2 from line 1. Enter the result on line 3 and do not complete the rest of the worksheet. If line 1 is less than line 2, continue on to complete lines 4 through 9. 4. Enter the number from line 2 on line 4. 5. Enter the number from line 1 on line 5. 6. Subtract line 5 from line 4, and enter the result on line 6. 7. Use Table 2 of the worksheet to complete line 7. Be sure to use wages from your highest-paying job. 8. Multiply line 7 by line 6, and put the result on line 8. 9. Divide line 8 by the number of pay periods you have left in the current year. Put this amount on line 9. The total number of allowances from any previous worksheets will go in line 1 of the Two-Earners/Multiple Jobs Worksheet. Once this number has been calculated, you can proceed to follow the instructions on lines 2 through 9. Fill out fields 1 through 4 with your personal information. For W-4 line 5, enter the total amount calculated in line H of the Personal Allowances Worksheet if you did not complete a Deductions, Adjustments and Additional Income Worksheet; if you did complete the Deductions, Adjustments and Additional Income Worksheet, the amount from line 10 of that worksheet will go on line 5 of Form W-4. If you completed the Two-Earners/Multiple Jobs Worksheet, put the amount from line 10 of that worksheet on line 6 of Form W-4. If you did not fill out the worksheet, line 6 should say $0. Carefully read line 7, and make sure you meet both requirements if you plan on claiming exemption from withholding. If you meet the requirements, write “Exempt” in line 7. If you do not, leave this line blank. Sign and date your form and give to your employer to fill out fields 8, 9 and 10. Your completed W-4 form should look similar to the W-4 example above. 1. What’s the difference between a W-4 and a W-2? A W-4 is the form you fill out upon employment so your employer withholds your desired amount of federal income tax from your paycheck. A W-2 is the IRS tax form you receive from your employer at the end of the tax year. It includes information on how much money you earned, how much money was withheld for federal and state taxes, and other contributions including to Social Security and your employer-sponsored 401k account. You’ll use Form W-2 when filing your taxes. 2. What should I do if I’m earning money from two jobs? When you have income from two jobs, you only need to complete one W-4 form, but you must split your allowances between the W-4 forms for each job. According to Turbo Tax, it’s recommended that you claim all of your allowances on the W-4 form for the highest-paying job and claim zero allowances on the others. 3. How do I know if my employer is withholding too much from my paycheck? Once your W-4 form takes effect, you can use the IRS withholding calculator on IRS.gov or reference Pub. 505 to see whether the amount being withheld is comparable to the projected total tax for the year. 4. Will the amount of money I earn from investments and dividends affect my W-4? The IRS classifies investments and dividends as non-wage income. When you’re earning a significant amount of non-wage income, you can make estimated tax payments using Form 1040-ES to avoid owing additional tax when tax season rolls around. 5. How many allowances can I claim on my W-4 form? The maximum number of allowances you can claim depends on the number of exemptions you’re allowed to claim. You might be claiming a dependency exemption on your federal income tax return, which means you’ll be claiming at least one allowance for the number of dependents on your W-4 form — reference line D on your Personal Allowances Worksheet. 6. How does my W-4 form affect my net pay? Your employer deducts your tax withholdings based on the number of allowances you report on your W-4 form, and each allowance reduces the amount withheld. To put it another way: “When filling out the W-4, I like to remember it like this: The more allowances you claim, the less tax will be withheld from each paycheck,” said Bill Weekes-Ruesch, MBA, CPA and operations manager at Easier Accounting. 7. How much will each additional allowance affect my take-home pay? Figuring out how much one additional allowance will affect your take-home pay requires some simple math. First, multiply your tax bracket rate by the amount of one exemption, which is $4,150 for Tax Year 2018. For example, if your income is taxed at a rate of 22 percent, the annual tax benefit of one exemption is $913. If you want to break down how much that will affect each individual paycheck, divide that number by the total number of pay periods in a year. If you are paid weekly, that means each paycheck would increase by $17.56. 8. Is it better to have more earned income withheld to be on the safe side? The best thing to do is to carefully take the time to fill out the W-4 worksheets and form to ensure the amount you are requesting to have withheld is what it should be. 9. What are the downsides to having more tax withheld and getting a larger refund at the end of the year? It may seem nice to get a big fat tax refund in the mail, but you’ll wish you had access to those funds earlier if you need them for an emergency or any unforeseen expense. You’re likely better off having the money that’s rightfully yours in a savings account or other fund than with the IRS, so you can access that money on your own terms. Click through to see how to read your pay stub.